The Imperial Family Bible containing the Old and New Testaments, according to the most approved copies of the authorised version. Printed by: Blackie and Son, Warwick Square Paternoster Row, Edinburgh, and Glasgow. The above named Arthur Wheelwright Foster died at no 40 Coldbrook Avenue West Ealing on April 15th 1920 and was cremated at Golders Green Cemetery London. The above named Mary Emily Foster died at Oakwood Nook Roundhay Leeds April 12th 1923 and was interred at Lawnswood Cemetery Leeds. Walter Foster married At Belgrave Chapel Leeds August 21st 1890 to Janet Veuers? Dorothy Foster Born at 25 Clarendon Place Leeds July 8th 1891, daughter of The above Walter Foster and Janet Foster. 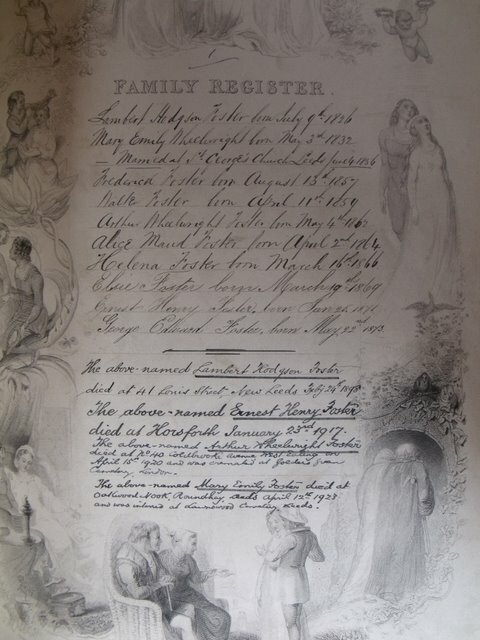 Arthur Wheelwright Foster Married at Lancaster Parish Church June 6th 1895 to Elizabeth (Bessie) Thompson. Frederick Foster Married at Wallasey? Church to Nellie Percival June 21st 1898. Ernest Henry Foster Married at Headingley Hill Chapel Leeds to Nellie Marshall May 18th 1899. Muriel Foster second daughter of the above named Walter Foster and Janet Foster born at West Lodge Chapel Allerton on Sunday 30th Septeber 1900 at 10.27 in the forenoon. Janet Mary Foster 3rd daughter of the above named Walter Foster and Janet Foster born at West Lodge Chapel-Allerton on Saturday the 11th October 1902 at 3.55 in the morning. George Edward Foster married at Headingley Hill Chapel Leeds to Kate Marshall September 3rd 1903. Ernest Marshall Foster son of the above Ernest Henry and Nellie Foster born at "The Rookery" Scotland Lane Horsforth at 8pm on the 6th September 1907 (Friday). The above named Dorothy Foster married at Edgeware registry Office London to Sylvester Solomon Zilva on the 22nd July 1924. The above named Muriel Foster Married at St Peters Church Harrogate to Frank Lupton on 11th June 1925. Joan Foster Zilva daughter of the above named Doroth and Sylvest Solomon Zilva born at 129 Wigmore Street (nursing home) Marylebone on Monday 23rd November 1925 at 2.10 pm. The above named Janet Mary Foster married at St Wilfreds Church Harrogate to Harold Lupton on the 13th September 1928. Janet Foster wife of the above named Walter Foster died at 47 Kent Road Harrogate on the 7th of December 1929 ,was cremated at Lawnswood Cemetery. Adrian Philip Lupton son of the above named Muriel and Frank Lupton born at Woodsley private hospital, Woodsley road Leeds on Monday the 19th June 1933. Bryan Kenneth Lupton son of the above named Janet Mary and Harold Lupton born at Woodsley private hospital Woodsley road Leeds on Friday 4th October 1935. The aforenamed Walter Foster died at Duchy Court Nursing Home Harrogate on 25th March 1938 at 6.10 pm (residence-Duchy Grange Kent Road Harrogate) aged 78 years cremated at Stonefall Cemetery Harrogate. Ashes Lawnswood Columbarium (Leeds). Frederick Foster died at Westover 94 Wallace Avenue Worthing (Sussex) on 1st March 1949 aged 91 years Cremated at Brighton Cemetery. 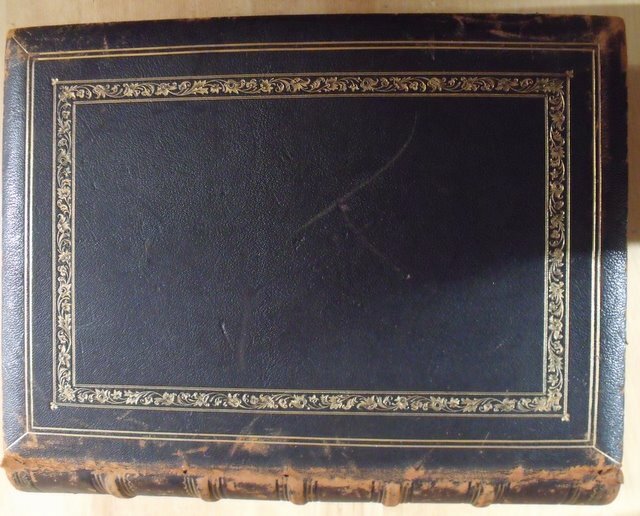 Original owner is in Cambridgeshire: bible has since been re-homed to a family member who found it via this site.